After a heartbreaking finish at Group Championships last season North Hunterdon has shown their strength and rightful NJ#1 status so far in 2017. On Saturday they defeated NJ#2 Ridge 82 to 104 winning their first state title since 2000 when the school won the Group 3 title. The effort was led by sophomore Chloe Gonzalez who had a breakout Holmdel Park performance dropping her course PR from 19:26 to 18:49. She now ranks ninth individually at the state course this season. North Hunterdon placed three girls in the top ten averaging 19:32 and splitting 1:28 between their top five scorers. The girls Group 3 Championship was an intriguing race going in not only individually but on the team front as well. Colts Neck defended their title in a hard fought battle with Middletown South 89 to 100. Indian Hills was third and the final wild card spot went to fourth place Northern Highlands. 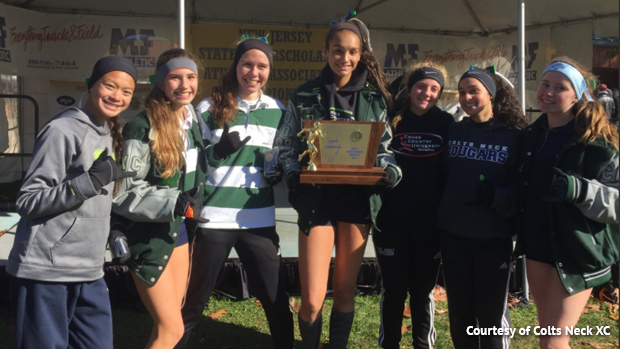 Colts Neck showed us all that they are arriving right on time as they entered the weekend ranked NJ#8 and left it NJ#3 in the State Rankings Poll. Their title run was led by Colleen Megerle in 10th at 19:14 and was essentially driven by a strong mid pack finish claiming 18th through 20th thanks to Eva Gibson, Delia Russo, and Natalie Shapiro. Catherine Anderson closed their top five in 32nd. One of the more exciting finishes on the day came in the Non-Public A when Union Catholic won their second title in three years over defending Red Bank Catholic 63 to 65, Pingry School also in the mix scoring 69 points for third. Jerika Lufrano's low scoring 18:51 for second place played a big part in the close win as did their mid pack performance. Megan McCabe and Zamira Ysaac finished right with each other in 15th and 16th at 20:32. Villa Walsh continued their dominance in the Non-Public B with their fourth straight win and fifth in school history. Scoring 39 points with a 1:33 split and 20:54 average their girls came through 2+4+8+10+15. Their top finisher was freshman Sarah Hanifin in third at 20:09. In the Group 2 competition Haddonfield was unseated as defending champs by Voorhees 75 to 119. Voorhees came in running hot from a great Sectionals performance. Their efforts on Saturday were led by Nicole Cassavell in second at 19:19, Lauren Wagner who led the team at Sectionals was fourth at 19:28. Metuchen won their second straight title in Group 1 with a score of 75 to 85 against Mountain Lakes. Nina Suss was the head of the attack in fifth at 20:23.